If you are a friend of mine on Facebook, then you already know how excited I am this week. A week long vacation for my husband, plus a trip to Alaska, means that I now have just under 100 pounds of wild caught halibut and wild red/sockeye salmon in my freezer. I am so happy with the abundance that I have already filled several notebook pages with cooking ideas! 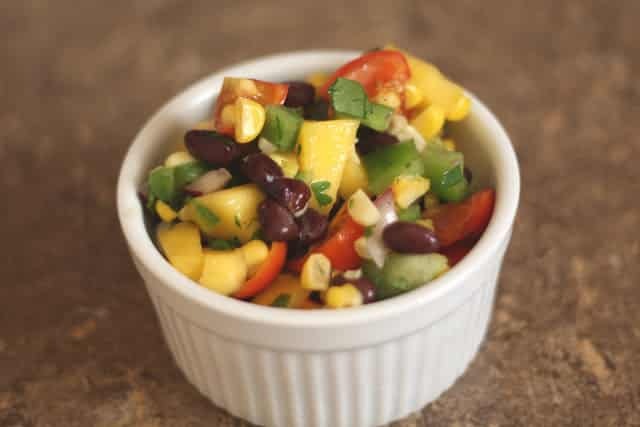 Fresh corn, mangoes, tomatoes, bell peppers and onions combine with a slight kick from jalapenos to make this a great salsa (almost a salad) on it’s own. Served with chips, rice or fish, this salsa was cleaned off of every plate at the table last night. The kids especially loved the bites of mango, and so did I. I made the salsa 24 hours in advance, however it was a great blend of flavors from the start when I tossed it together. Combine all ingredients in a medium bowl and stir to combine. Taste and adjust seasonings. Refrigerate until ready to serve. 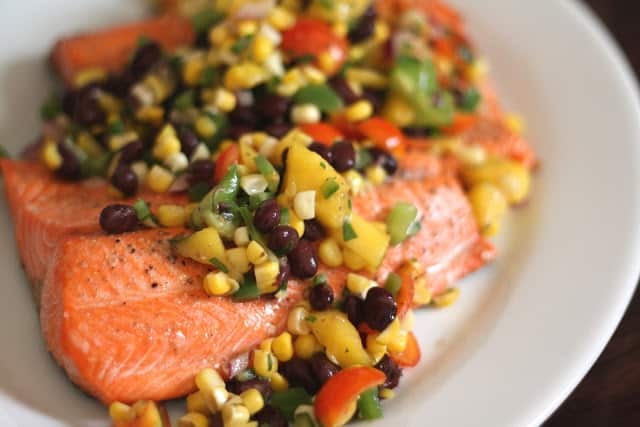 Serve over grilled or broiled salmon. Enjoy! Preheat the oven to broil and line a baking sheet with foil. Place the fillets skin side down on the foil and drizzle lightly with oil. Sprinkle generously with salt and pepper. Turn the fillets skin side up prior to placing them in the oven. Broil for just 2-3 minutes and then flip the salmon over (skin side down). Broil for a few more minutes. A general rule for cooking salmon is approximately 8 minutes total cooking time per 1″ of thickness. Cook the fish 2 minutes less than your estimated time, then check for doneness. You can always pop it back in the oven, but you can’t fix an overcooked piece of fish. The most important thing to remember is that the fish will continue to cook for a few minutes after it is off the heat, so you have to remove it just before it is done to your liking. Salmon is best warm and flaking, but still a bit translucent even after resting. 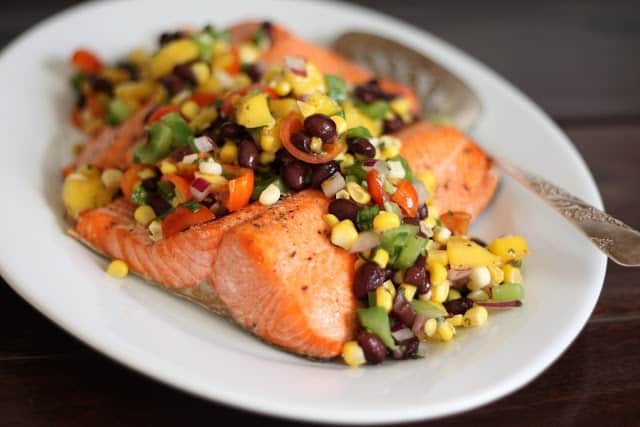 Serve the salmon topped with the mango salsa. Enjoy! I can't even imagine how good that fresh salmon is, but I know that salsa only enhances the fishes goodness! Thanks so much for the awesome recipe. I made this for my sister's birthday. Asparagus and allspice butternut squash accompanied it. Everyone loved it.